An adaption of a recipe from allrecipes.com from a class I taught in early 2005. I wanted to show how to adapt dairy and gluten filled dinner recipes that might be family favorites easily to GFCF. 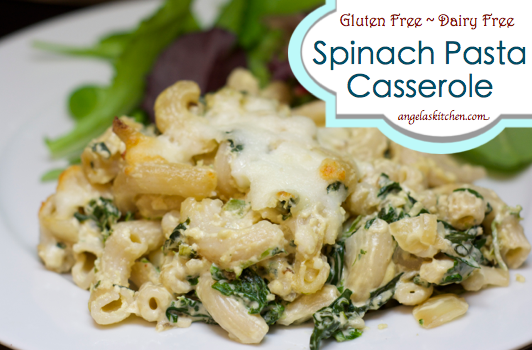 Gluten & Dairy Free Spinach Pasta Casserole uses commercially available substitutes, as that was the focus of the class was the easiest readily available solution, but feel free to use homemade ones instead. 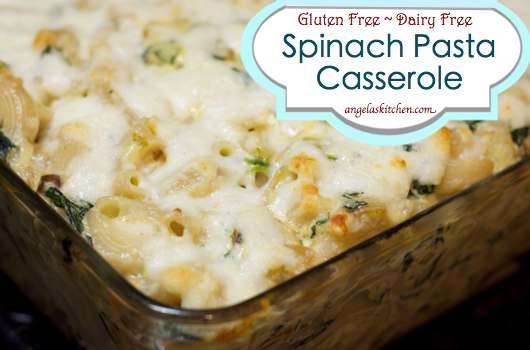 Gluten & Dairy Free Spinach Pasta Casserole is a dressed up baked mac’n cheese, alfredo-style. YUM! If you have leftover turkey from Thanksgiving or ham from Easter, toss 2 to 3 cups chopped into the dish. Also, cooked and crumbled bacon (about 1/2 pound) is amazing! Heat olive oil in pan. Add mushrooms, onions and jalapeño and sauté over medium heat 3-5 minutes. Mix dairy free cream cheese and Parmesan cheese substitute, milk substitute, and eggs until smooth. Fold in spinach, sautéed vegetables, and nutmeg. Mix noodles and vegetable/sauce mixture together. Spoon into a 3-quart casserole coated with oil. Sprinkle with cheese replacement, if using. Serving suggestions: Fresh spinach salad with mangos.